Washington, D.C., Metro Police Detective Sergeant Sam Holland needs a big win to salvage her career--and her confidence--after a disastrous investigation. The perfect opportunity arises when Senator John O'Connor is found brutally murdered in his bed, and Sam is assigned to the case. Matters get complicated when Sam has to team up with Nick Cappuano, O'Connor's friend and chief of staff...and the man Sam had a memorable one-night stand with years earlier. Their sexual chemistry still sizzles, and Sam has to fight to stay focused on the case. Sleeping with a material witness is another mistake she can't afford--especially when the bodies keep piling up. 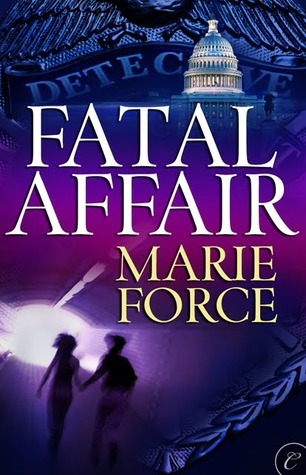 Fatal Affair by Marie Force is the first in her Fatal series. It is a reread for me as a couple of years ago I read through this series obsessively until I had caught up to date. Now I wait each time with anticipation for the next one ..... coming out early in 2015 by the way. I think Nick and Sam might just be my favourite couple in romantic suspense books, although Eve and Roarke from the J.D. series are in the mix too! I loved this book every bit as much as I did the first time reading it. In fact I will be giving it an increase of one star from the first time I read it! I remembered who was responsible for the main murder, but had forgotten quite a few details and that there was more than one murder. ( Sorry that is a bit of a spoiler). I loved refreshing my mind about both Sam and Nick - their background histories and the beginning of their relationship. Many of the other characters that we meet and get to know as the series progresses had minor parts to play and it brought back the pleasure of later reading their developments. I may not get to reread the rest of the series just now, but I believe it would stand the test. My sense of delight with the book and series was still there as I finished. Heart hit. If you enjoy romantic suspense and have not read this series - try it. It's great that you gave it an extra star rating this time! I think I was tougher when I was younger!! Now I think... I loved it, so why not go to top marks! I enjoyed the review, sounds like a good read. I think that this would interesting. I love books like these, I love true crimes ones as well. Interesting.